Seventy-four people have fallen ill since July, and one person in California died since November 2017, according to the Centers for Disease Control and Prevention (CDC) Friday. Salmonella is a bacterial infection that can cause diarrhea, fever and stomach cramps for four to seven days and requires antibiotic treatment. Children and the elderly are most likely to develop severe cases of salmonella, and the bacteria can be very dangerous if the infection spreads to an individual’s bloodstream. Wash your hands before and after handling raw turkey products. Keep raw turkey separate from other food you are preparing. Do not feed raw meat to pets. The salmonella outbreak in turkey products has hospitalized 63 people since this particular strain of the bacteria was identified in September 2017. “All of these illnesses could have been prevented. There’s either cross-contamination going on in the home, or there’s not thorough cooking,” Jennifer Quinlan, who teaches in the nutrition sciences department at Drexel University, told Kaiser Health News. 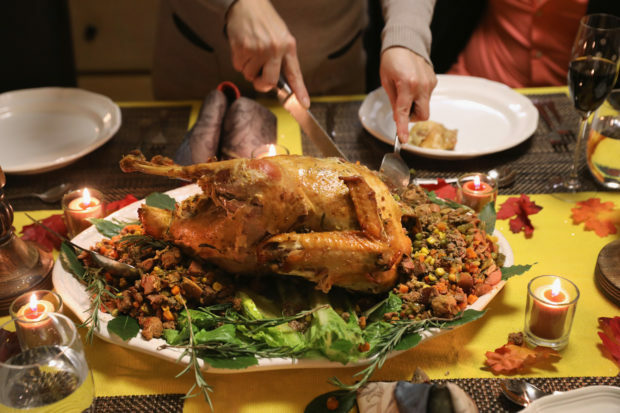 There is a bright side when it comes to buying the Thanksgiving turkey this year: A survey on the price of traditional Thanksgiving foods including turkey, sweet potatoes and cranberries revealed a drop in the average price of dinner for families in 2018. Those dishes are probably quite different than what Spanish explorers ate at what is considered the first Thanksgiving dinner celebrated on American soil in 1565.